Spot The Steal - Christian Louboutin "Fifre"
Though Christian Louboutin's Fifre bootie was originally from last winter, it seems everyone is 'inspired' by the fabulously constructed military design this time around. 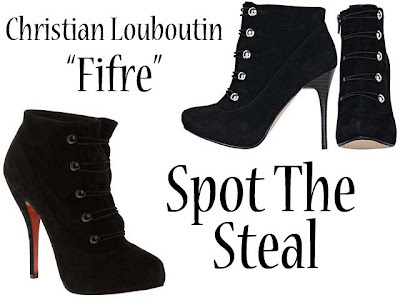 The Fifre (now sold out) went for about $1200 whereas Alloy's Riana Bootie goes for just under $40**. What do you think, Can you Spot The Steal? I must have these ! But I will wait for a little while because I have my eye on a couple of other things at alloy . Thanks for the code !